Wondering how well your content is doing? Just ask your customer. Online surveys are an easy way to gather customer feedback and research that helps you make better-informed business decisions. At USGBC, we recently launched a global language survey to see how we could enhance our international audience’s LEED experience. Here are several guidelines to follow when launching a survey, from writing the questions to sharing the final results with coworkers. Define your survey’s purpose, and write a marketing plan. Before you get started on drafting any survey questions, ask yourself: What do you want to know? After determining what information you’re looking to collect, write it all down by creating a marketing plan, which should include target audience and promotion tactics, to share with your team. Our survey aimed to capture key demographic information about our international audience, so we could sketch a customer profile in terms of industry, job level, age, location and primary language. We opted to keep the survey open for three weeks and distributed it through an article, emails and USGBC’s social media channels. We also leveraged our staff’s international contacts to help promote the survey. Draft your survey questions, and share them with your team for their feedback. Keep your questions as simple, direct and short as possible, so there’s no confusion about what’s being asked. Avoid any leading questions. What is your country of residence? How long have you lived in your country of residence? What is your primary language? Are you fluent in any other languages Is English the primary language you use at work? Which of the following most closely matches your job level? SurveyMonkey has a great list of tips on writing effective survey questions. After you’ve finished writing your questions, make sure to share the draft with your team for their input and pick a survey platform to use, such as GetFeedback or SurveyMonkey. Ask your team to do a beta test to get an average on how long the survey takes to complete and to determine if any questions need additional polishing. Reporting the results: Make sure to include key takeaways and charts. After your survey is over and you have all the data, build out several charts and graphics to share within your company. Make sure to include within your report your survey’s duration, number of responses, methodology and high-level observations. Our survey results suggested our international audience is fairly young, fluent in English and mid-level in their industries, with the top three being in design, engineering and construction. Spanish is the most popular native language, followed by Portuguese, English and Chinese. Interestingly, we found that the majority of our users preferred to use English resources in studying for a LEED professional exam or working on a LEED project. Written by Ursula Fox-Koor and Jake Rose. As the email experts at USGBC, we use a number of strategies to make sure our email marketing is effective and useful for the customer. Here’s a breakdown of what we do, and how you can use these strategies to enhance your own email reach. Collect data on new contacts. All email contact lists slowly shrink, as people change jobs, switch email accounts and unsubscribe. To keep your email list at its current size, you need to continually add contacts to your database to offset this expected attrition. The data you capture from new contacts is as valuable as the email address itself. The more data points you have on each contact, the better you can target them with different messaging. Examples of data points we collect at USGBC are job title, company, industry, location and LEED credentials. You can prompt users to fill out a quick form once they click the subscribe button. It should be simple—you don’t want to include too many fields, or you will lose them. Conferences and events are another easy way to get new email addresses; you should have the email address of every person who registered for an event, even if they didn’t show. Not everyone should receive the same message. Target your audiences, based on their data points, with different messaging. People will be much more receptive of your content if it is relevant to them. If you want to start an email campaign advertising an architectural conference, building contractors do not need to receive that message. A smaller, more targeted list is always better than a large list with no target. Think about what is relevant to people in different industries, with different titles, who live in different cities, and so on. An easy way to clean up your deliverability and opens is to exclude those who aren’t opening your emails, or whose email addresses have hard bounced. Put these people into another segment. You way want to think about a reactivation campaign if they haven’t opened an email in a year. A/B testing is a great way to figure out what makes your audience respond. This is the practice of dividing an email segment in half and sending the two groups different versions of your message. Make sure that you only test one variable at a time. If you are testing both your subject line and the time of day the message is sent, how will you know to which program to attribute success? The most common A/B test is the subject line, but you can also A/B test the “from” name, the time of day and the content of the email itself. Our recent USGBC email subscription update campaign is a prime example of including a stimulating visual. Rather than listing the steps of the call to action, we showed them through a gif. Feature the USGBC brand on top of every email; it should be clear who the sender is. Break up the text with bullets, icons, buttons, gifs, images or videos. Include a calendar reminder feature. This puts the event on the recipient’s calendar, giving the event visibility beyond the inbox. Include a teaser headline. This helps with the flow of the email and emphasizes your call to action. Be transparent with your branding. We took the footer as an opportunity to show the subsidiary brands under USGBC. This is also an opportunity to promote these brands. Make sure your call to action is clear and placed “above the fold” (you don’t want your audience having to work to find it). Use the preheader text as a second subject line. Include fun images and even GIFS to show rather than tell. Apply all these tips to future email campaigns, and keep track of what you’ve learned. Continually test and improve your campaigns. You can test email color schemes, feature images, times of day, days of the week, etc. Have fun with it! Email is a stand-alone tool, and is best used when in conjunction with other media. Posting on social or writing a related article are great ways to reinforce the message. High on my list of goals for the year was to take more time to recognize—and celebrate—our amazing creative services and marketing team at USGBC. If you’ve spent any time on USGBC Studio, you’ll have seen the caliber of talent stockpiled within the team, and you’ll understand why gratitude topped my to-do list. My plan? Submit some of our favorite creative work from the past year into industry competitions. (Usually we’re too busy doing the work to take time to applaud the work). I’m pleased to announce that our team took home a number of prestigious awards, including two American Inhouse Design Awards from Graphic Design USA and a Hermes Creative Award. 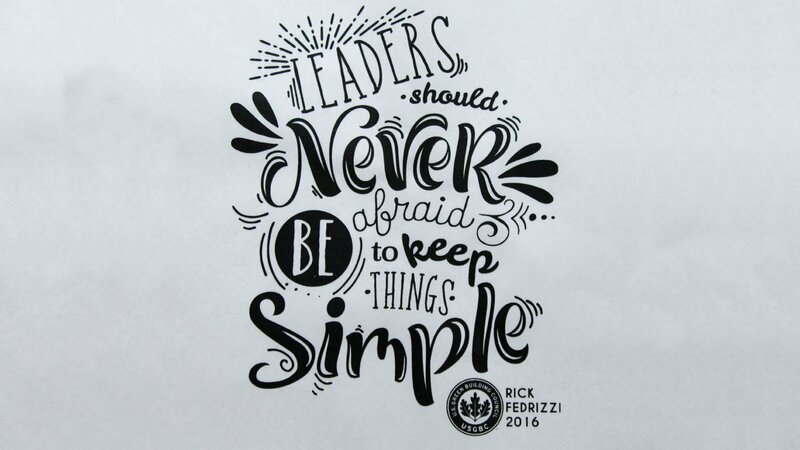 This limited-edition tee for Greenbuild 2016 honored industry champion Rick Fedrizzi and was featured previously on Studio.